SUSSEX COUNTY – Assemblyman Parker Space and Assembly candidate Gail Phoebus, both owners of small businesses in Sussex County, were pleased today to accept the endorsements of three of the largest political organizations representing business owners in New Jersey. The two conservative candidates are running in New Jersey’s 24th Legislative District, which encompasses all of Sussex County and parts of Warren and Morris Counties. The National Federation of Independent Business of New Jersey Save America’s Free Enterprise Trust (NFIB SAFE Trust); the New Jersey Organization for a Better State (NEW JOBS), the political arm of the New Jersey Business and Industry Association (NJBIA); and the Private Enterprise Political Action Committee (PENPAC) of the Commerce and Industry Association of New Jersey (CIANJ), all endorsed Space and Phoebus. “In these difficult economic times, it has never been more important to elect and retain pro-business candidates and legislators who understand the needs of business,” said Stefanie Riehl, Executive Director of NEW JOBS. 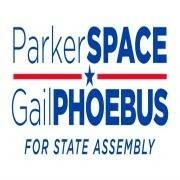 Space and Phoebus welcomed the support of their fellow small-business owners for their Assembly race. “These endorsements are proof positive of my pro-business/pro-jobs voting record. As a member of the Assembly Labor Committee I have defended small business and free enterprise in New Jersey,” said Space. “Since being in office, I have voted against tax increases on small businesses, and during my first term saw my legislation enacted to make reforms to the Unemployment Trust Fund to save money for both employers and employees. “Parker and I are proud of our ‘triple crown’ endorsements and it was really special to me as a non-incumbent” said Phoebus. “The organizations and their members were impressed by my business acumen, my record as a county and local official, and my grasp of the issues we face in Trenton. They know I will stand up and fight the anti-growth agenda of the Democrat majority in the Legislature.